This information about using estimate request forms is available to download in PDF format from the Estimates Page. To enhance the customer experience, Facilities Management has created new graphic interfaces for project estimate requests. There are two choices of interactive forms, allowing requesters all they need to get their project estimates. Please download and save the forms as templates for any future estimate request. Capital Project and Standard Project forms have been updated, changing the submission process. Annotation for guiding users is imbedded in the following updated Excel forms. 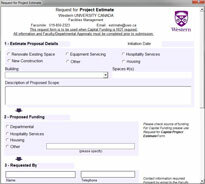 Request for Project Estimate Form.xls – is for estimate requests with proposed scopes that do not involve capital funding, but instead departmental funding. Please Note: Estimate request must be made using the provided authorized project form. Estimates will no longer be acceptable including, call-in requests, requests through the FM Service Centre, and email requests not using the forms. 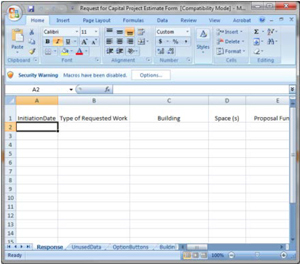 The documents are an Excel-based form, and their functionality requires Excel 2007 or later and macros must be enabled. It is recommended that users double click the downloaded forms to launch a new session of Excel with macros enabled automatically. If you can’t enable your macros, consult the Excel help documents or contact your IT Administrator. The forms have step-by-step instructions imbedded to guide new users. For example, arrows direct users from section to section and adjacent dialogue describes the purpose of each section. Forms completed with all information and approval are submitted and placed in a queue, based on the date of receipt at estimate@uwo.ca. FM’s estimator will contact the requester to arrange a site meeting and engage in the development of the scope and budget. At the time of the site meeting the schedule for completion of the proposal will be discussed, based on the current queue and volume of estimates in the system. While the forms have been extensively tested, variations in Excel applications do exist, and if there are problems encountered using the forms, first contact the department IT personnel for assistance, and report issues via email to estimate@uwo.ca. Incomplete forms without all necessary information and approvals will not be accepted, and returned via email. Depending on the time of year and volume of requests response times will vary. While requests will be placed in a queue, those requests involving teaching space and those for grant submission deadlines will take priority. There will be a time of transition, finishing up current budget requests in the queue, and fine tuning the system of receiving and processing the email request forms. Requesters should plan ahead and allow time for approvals from their department and Provost if necessary, with additional consideration to the time of year (Capital Budget Planning; Summertime Work, Research Grant periods) and other work that may be in the queue.